Last year, I was lucky enough to read an advanced copy of Not If I See You First – a book I quickly fell head over heels in love with. Eric Lindstrom has done it once again with his new novel A Tragic Kind of Wonderful. It is dark, fearless, and profound. The details and evolution of the narrative pull you deep within Mel’s life and her struggles. A Tragic Kind of Wonderful is, without a doubt, a true work of art. Mental illness is a topic that is gaining more and more traction in the Young Adult community, and rightfully so. 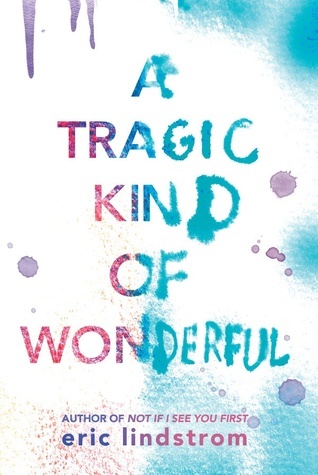 A Tragic Kind of Wonderful delves into the intricacies and complications of Mel Hannigan’s life as she goes day to day living with bipolar disorder. Mel has frequent mixed states and an increased rate of emotional cycling, which causes her to be prone to dysphoric mania when her emotions are all up and running on the higher end of the spectrum. The important thing about this books is that Mel has bipolar disorder, it makes a very clear distinction between her having bipolar disorder and the social construct of those suffering from mental illness being nothing more than their illness. In other words, the book isn’t about her being bipolar, it’s about her living with bipolar disorder. Trust me, there is a huge difference. The power in the writing comes from Mel learning to deal with the things she would rather run from. She doesn’t want her friends to find out about her illness, her brother’s death, or how badly she struggles to put a smile on her face when she is down. Mel’s struggles become our own in ways I can’t even describe. Her voice is powerful, poignant, and progressive. She is self-aware, yet she still struggles. She is completely and utterly human. Lindstrom has created something wondrous by creating such a believable and real character who struggles with something most people don’t understand. In addition to the compelling exploration of Mel’s Bipolar Disorder, there is an even deeper thread that weaves together dealing with grief, friendships, and first loves in a startlingly explosive voice. It is brilliant. The story is so subtle, yet ultimately not at the same time. It is a fearless immersion into something not often explored. I don’t know how to stress the importance of what Lindstrom has done here with his characters and their relationships to the world around them. It is innovative and intoxicating and imaginative. A Tragic Kind of Wonderful is breathtakingly beautiful and captivating. It is unforgiving and honest and it will bring you through a roller-coaster you cannot possibly prepare for. It is a book about acknowledging even the darkest of our thoughts and feelings and accepting every inch of of ourselves – even the parts we might not like as much as the others. A Tragic Kind of Wonderful is exactly the kind of wonderful we all need to witness.